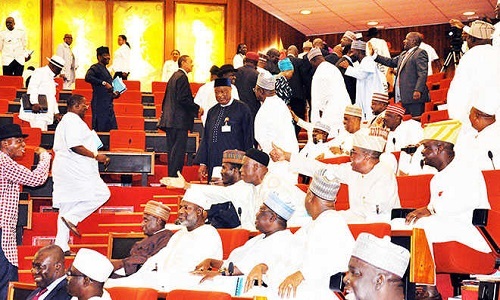 The senate is currently in a rowdy session following Dino Melaye’s announcement for his defection to PDP. Dino during plenary this morning, thanked his colleagues particularly members of the PDP for standing by his during his ordeal with the police. He thereafter asked that a seat be made available for him with members of the opposition party and afterwards will write a letter to the senate president formally defecting to PDP. Shortly after his announcement, the APC nad PDP senators engaged in s firrce exchange of words. Dino is right now sitting beside former Senate President, David Mark.